Israeli soldiers uprooted, Wednesday, dozens of olive, almond and fig trees owned by a Palestinian villager from Deir Ballout, west of the northwestern West Bank city of Salfit, bringing the number of uprooted trees to approximately 350 in less than 72 hours. The uprooted trees were in a Palestinian agricultural land in Bab al-Marj area, east of Deir Ballout, and are all owned by one Palestinian, identified as Edrees Jabara Abdullah. 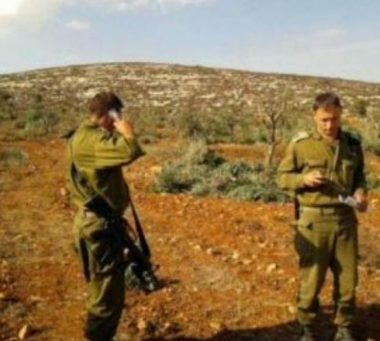 The soldiers also issued a demolition order targeting a shed in the area, and continued the bulldozing of Palestinian lands to build a water distillation plant for the illegal Lashem Israeli colony, which was built on lands owned by villagers from Deir Ballout. The latest Israeli violation brings the number of uprooted trees in the same area to 350 in less than 72 hours. On Tuesday, illegal colonizers attacked Palestinian homes in the northern West Bank village of Aseera al-Qibliyya, and set farmland on fire. Israel’s colonies in the occupied West Bank, including occupied East Jerusalem, are illegal under International Law and the Fourth Geneva Convention. The Palestinians continue to lose their lands, their livelihood, for the construction and expansion of the illegal colonies, and have already lost thousands of Dunams that became isolated behind the Annexation Wall, which in 2004, the International Court of Justice issued an advisory ruling deeming it illegal, due to the overwhelming economic and social problems it caused for Palestinians, and called for dismantling it.